Sneaking out of the Vatican at night, washing the feet of inmates, and taking selfies with young fans is certainly unlike any religious leader we've seen in a while, and some of the religious establishment is uneasy about it. The revitalization Pope Francis is bringing to the Catholic Church is not without precedent, however. Jesus had a similar effect in his day, drawing crowds with his humility, kindness, and wisdom-even as he drew the disapproval of established religious leaders. The things that have brought Francis such media attention are the same things that made Jesus so peculiar and attractive in his day. Thoughtful examination of Jesus' example and legacy, as well as an honest look at the similarities and differences between Catholic and Protestant faith, invites reflection on the heart of Christianity and how we relate to our fellow Christians. Readers will discover the power of heartfelt joy, radical love, and passion for justice to shake people out of religious complacency and into dynamic, contagious faith. 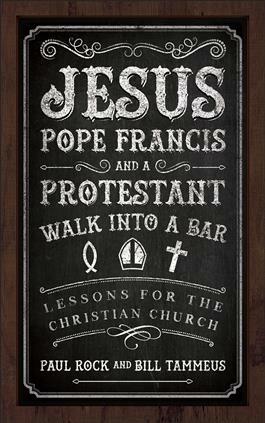 Jesus, Pope Francis, and a Protestant Walk into a Bar looks at what is universal among Christians, what is unique to Catholics and Protestants, and how all Christians can practice understanding and cooperation across differences. With seven engaging chapters and questions for discussion and reflection, this book is ideal for both small group study and individual reading.